She's a singer, not a fighter - but Dazzler was always destined to be one of comics' brightest stars! 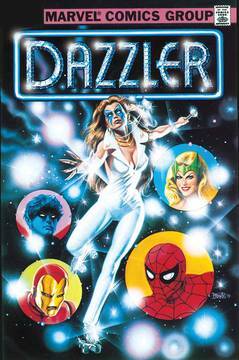 Journey back to the days of disco to join Spider-Man, the Avengers and the X-Men in welcoming Alison Blaire to the Mighty Marvel firmament with this impeccable facsimile of the first issue of Dazzler's sparkling solo series! Alison's mutant powers place her at a career crossroads. Can she be a singing sensation? A stellar super hero? Or both? But when Alison dons her iconic roller skates to make an important audition, will she dazzle everyone - or will the Asgardian Enchantress steal the show?! It's a landmark issue of the 1980s, re-presented in its original form, ads and all! Rated T.